Rampver Financials clients will enjoy 30% off on ticket prices! As the Philippine economy continues to be one of the most promising economies of Asia, the need to educate and encourage the Filipinos to be financially empowered and secure his future becomes very important. 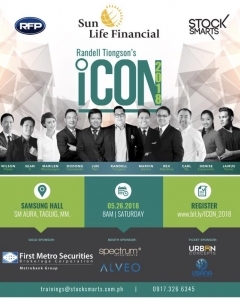 Randell Tiongson’s investment conference, or #iCon was organized in the hope to further the financial and investment education of many Filipinos and it has stood out among similar conference because of quality, reach, content, roster and the like. #iCon does not only inform it’s audiences, it empowers them. Due to its success, #iCon is now running on its 6th year. #iCon2018 continues its tradition of featuring the best minds of the industry but we are also featuring new and exciting additions this year. 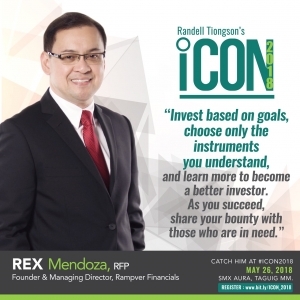 Joining the ranks of #iCon2017 are: Marvin Germo, the country’s leading stock market advocate; Rex Mendoza, leading investment advocate and one of the most sought out investments thought leader; Dodong Cacanando, the very inspiring business and agriculture expert – all of which have been favorite speakers of past iCons. We are also featuring other speakers such as leading economists Dr. Alvin Ang & Jun Neri to give the audience a better understanding about the condition and the future of the Philippine economy. Younger yet successful entrepreneurs & investors are also featured such as Marilen Faustin-Montenegro, Sean Si, Denise Cacanando and Jairus Ferrer – all of whom will educate and inspire the younger audiences to build their futures. #iCon2018 will be held on May 26, 2017 at the Samsung Hall in SM Aura, Taguig City and will run from 9am to 6pm.